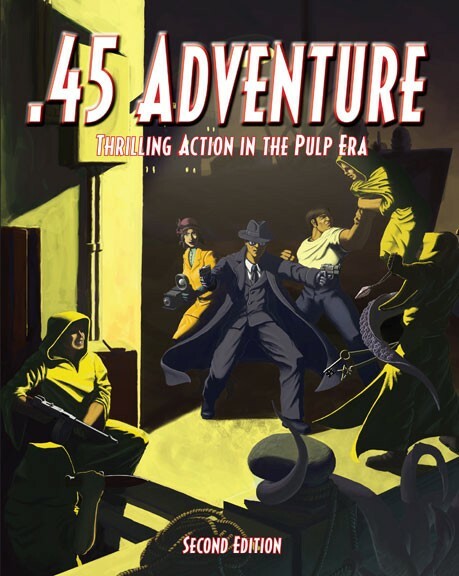 .45 Adventure: Thrilling Action in the Pulp Era is a tabletop miniatures game that simulates all the two-fisted action of the era of pulp magazines. Players can take on the roles of colorful heroes or unscrupulous villains. With Tommy guns, Heaters, and Gats they can fight their way through the minions of crime or seek to control the world. This new and updated rulebook contains all the rules you need to play; from combat to character creation. We have also folded all the rules from our previous supplements into this one title. So now you have rules for Campaigns, Super Science, Weird War, and newly added, the Occult! But this is not just the old rules put into one book. We have made changes to streamline game play. The action is faster without losing any of the character flavor you have come to enjoy. In fact, your heroes can now be more heroic and your villains more villainous.